From the beginning of the 2014 season right up until the gun went off in Beijing for the 100m final, Justin Gatlin has ruled the event. Usain Bolt was pushed aside because of injuries, a tiny race schedule and underwhelming performances that stretched all the way until today’s semifinal when he almost face planted coming out of the blocks. 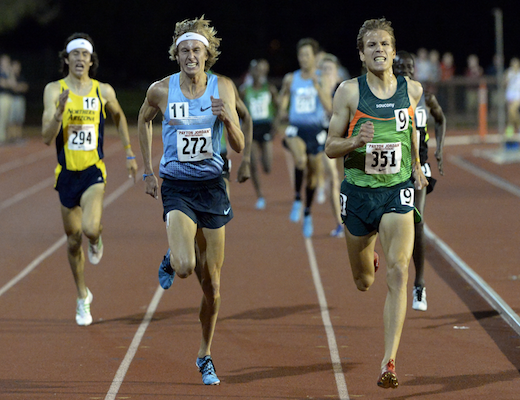 He ran 9.97 to win his heat, but every other finalist had also run under 10 seconds or faster. Gatlin posted a comfortable 9.77 in his section. This looked to be a predictable end to what in 2013 would have been seen as a monumental upset. Usain Bolt finally losing a major championships, and not to an ascendent star, but to Gatlin. Despite the stumble in the prelim, and a season that had no business giving him any faith he could beat Gatlin at all, it was Bolt and not Gatlin who ran with confidence in the final. Bolt got out of the blocks quicker than Gatlin (the first sign that this was going off script) and stuck close throughout the first half of the race. Gatlin, two lanes to Bolt’s right, had the smallest of leads with 30 meters remaining and then he came apart. It was subtle at first, but by the end of the race his arms were cycling and he was leaning much too early for the finish line. Bolt ran 9.79, Gatlin 9.80. It didn’t look that close. After the prelims, a Bolt victory by any margin didn’t seem realistic unless you were counting on a Gatlin meltdown. To do that, you had to ignore his season full of 9.7s with no poor races, as well as the prelim heat he had run just two hours before the final. But composure is part of the sport and Bolt has it for reasons we will never completely understand. The 200m takes on a completely new dimension now. Before the meet I thought the winner of the 100m would be the easy pick to also take the 200m. Now I’m not so sure. Maybe this race calms Gatlin down after he sees that despite all his mistakes he only lost by .01 seconds. Bolt will only be more confident though and historically has been better over 200m. In the battle for third, Andre De Grasse and Trayvon Bromell both ran 9.911 and will each get a bronze medal. -Jessica Ennis-Hill won the heptathlon with 6,669 points. Up until the entry deadline, Ennis-Hill was still debating whether or not she was healthy enough to compete. The British missed a chance at a 1-2 finish when Katarina Johnson-Thompson didn’t record a mark in the long jump. She had three huge jumps, but all were fouls. The last one by a tiny margin. If any of them were legal she would have been on the way to gold–silver at the very least. After scoring zero points, she dropped to the bottom of the standings. Permission to use “gutted” to describe her plight is granted, British fans. -Joe Kovacs won gold for the US in the shot put, beating David Storl. O’Dayne Richards grabbed a third place and will totally get all the headlines today in Jamaica. Jessica Ennis-Hill won the heptathlon. -Nijel Amos is out of the final in the men’s 800m. Brilliant strategy by David Rudisha to make their heat the slowest so Amos couldn’t qualify as one of the fastest losers. Actually, the strategy could have easily backfired on Rudisha if Amos had run the final 100 meters the way he was against Rudisha this whole year. He didn’t, and it is Rudisha who advanced with high hopes for gold now that Amos is out of the way. All of the other favorites advanced and both remaining Americans were eliminated. 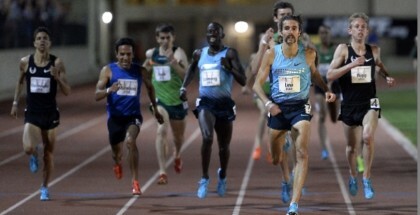 -There were no surprises in the women’s 1500m. Jenny Simpson, Shannon Rowbury, Genzebe Dibaba, Sifan Hassan and Faith Kipyegon all made it through to the final. -Shelly-Ann Fraser-Pryce’s hair raises the legitimate question of how many floral arrangements she can put in her hair and still win the gold medal? She and Tori Bowie both ran 10.88 in the prelim heats. 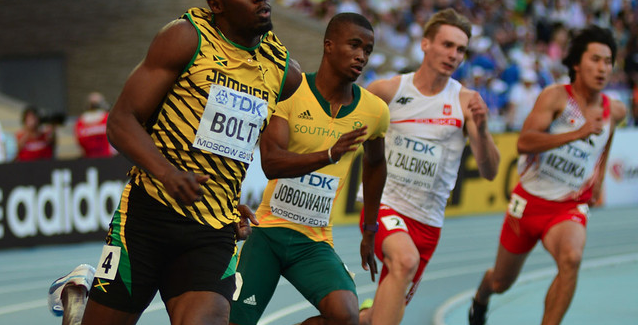 -Two men ran 43.93 in the ridiculously fast 400m opening round. 45.16 didn’t qualify. All four Americans advanced as did Kirani James, Wayde Van Niekerk and Machel Cedenio. -Kori Carter and Shamier Little squeezed into the next round in the women’s 400m hurdles. Little came apart on the homestretch, losing her rhythm completely and reeling off the final hurdle. If it wasn’t for a sudden lean, she’d would have slipped out of a qualifying position. Cassandra Tate led all qualifiers with a time of 54.27.